Bishop Thompson, the oldest of three children, was born in Louisville, Kentucky, on 11 April 1961. His parents, Coleman and Joyce Thompson, were born, raised and married in Marion County, where the family lived for much of Bishop Thompson’s grade school years (e.g. St. Charles Grade School, in St. Mary’s). His sacramental background includes the following: Baptized at Most Blessed Sacrament Church, in Louisville; First Communion at St. Joseph Church, in Raywick; Confirmation at St. Bernard Church, in Louisville; Diaconate Ordination at St. Bernard Church, in Louisville (25 October 1986); Ordained a Priest at the Cathedral of the Assumption (30 May 1987); Ordained as the Fifth Bishop of Evansville (29 June 2011). 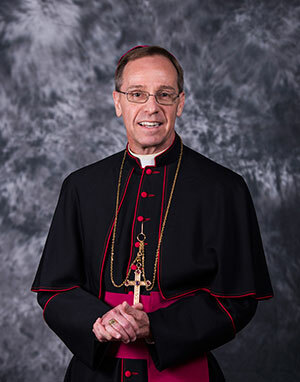 His education background includes the following: He graduated from Moore High School, in Louisville, in 1979; He graduated from Bellarmine College, with a BA in Accounting, in May 1983; He graduated from St. Meinrad School of Theology, in Indiana, with a Master of Divinity degree, in May 1987. He obtained his Licentiate (Master in Canon Law) from St. Paul University, in Ottawa, Canada, in May 1992. Bishop Thompson, age 56, was ordained a priest for the Archdiocese of Louisville on 30 May 1987. His pastoral assignments include the following: Associate Pastor of St. Joseph Proto-Cathedral, in Bardstown, 1987-90; Part-time Associate Pastor of St. Francis of Assisi Parish, in Louisville, 1992-93; Metropolitan Judicial Vicar & Director of Tribunals, 1993-98; Parish Administrator of St. Peter Claver Parish, in Louisville, 1994-96; Pastor of St. Augustine Parish, in Lebanon, 1996-2002; Pastor of Holy Trinity Parish, in Louisville, 2002-June 2011). He also served as Promoter of Justice and Judge of the Tribunal, as well as priest-chaplain to Sacred Heart Academy (2004-2011). In 2002, he began serving as Visiting Professor of Canon Law at St. Meinrad School of Theology. (Other prior assignments have included the following: Priest-chaplain to Bethlehem High School, in Bardstown, 1987-90; Priest-chaplain to Presentation Academy, in Louisville, 1995-97; Temporary Administrator to St. Elizabeth of Hungary and St. Rita Parishes). He served as Vicar General of Louisville, 1 July 2008 until June 2011, when he became Bishop of Evansville. Appointed Archbishop of Indianapolis by Pope Francis on 13 June 2017: His Installation Mass was Friday, 28 July 2017, when he also received the Pallium, the insignia of his role as Metropolitan of the Indianapolis Province.